This is seriously delicious! It made a huge old batch and none of us minded eating it 3 days in a row. I knew I was full but my fork was on auto pilot. That’s okay because it’s good for you too. This picture doesn’t do it justice…imagine fresh tomatoes, avocados, and sour cream on top. YUM. Combine all ingredients and put in a blender until smooth. Toss over rice and bean salad mixture and add more salt and pepper as desired. May also kick it up a bit with extra chili powder or chipotle seasoning. 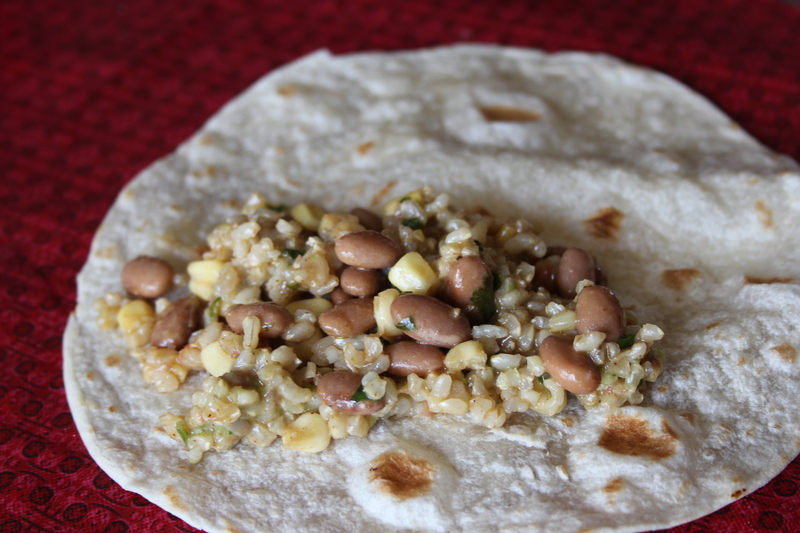 Serve on whole grain tortilla with a little melted cheese if desired or on a toasted corn tortilla or lettuce greens. We also dipped chips in it to spice up the leftovers. Give it a try. This is my new favorite dinner! 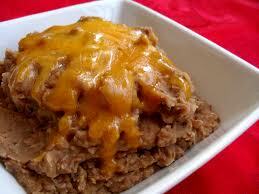 Do you know what makes canned refried beans so delicious? Lard. Not even kidding. Next time you are at the grocery store check it out. It really sets the good brands above the generic ones as far as taste is concerned. But…lard?? I have a hard time buying it now. Luckily, I found a super easy and pretty declicious recipe (from here) for refried beans in the crock-pot. Check it out. Remove the bigger onion chunks and drain the excess liquid. If desired, save excess liquid until the final product is desired consistency. Can’t get easier than that, right? They tasted pretty good too. We ate them by themselves with cheese, dipped chips in them, and put them in burritos with veggies. They lasted about four days! We usually have beans about twice a week around here, because it is a money saver, and packs in the protein we are lacking in the meat department. I bought a 25 pound bag of beans in JULY and have only used about 1/4 of it. Talk about getting your money’s worth. It’s a good investment and a versatile food. I am slowly building a relationship with these little babies. Right now we are in the “good friends” stage, but things are heating up and I think I might be ready to take this to the next level! I’ll keep you posted.